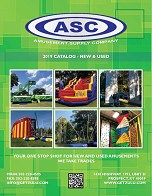 Amusement Supply Co. is proud to list this Vertical Reality Spider Climb Combo with Rockwall and Bungee Jump. Kids (Big & Small!) work their way through the elastic webbing to the top where they can slide down the big beautiful slide. 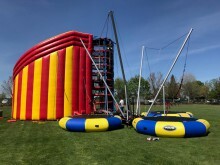 In addition, this unit features 2 rockwalls and a 3 station bungee jump! Although it has a few years on it, it looks NEW! Rock wall panels were refurbished and painted, the hardware and backing plates were all replaced. This unit is currently located in KY.
Click the button below to add the Vertical Reality Spider Climb Combo with Rockwall and Bungee Jump to your wish list.